I need a new dutch oven. Or a new oven. Or both. I burned the bottom of the first batch of this bread. Not that this stopped us from simply slicing off the browned bits and eating the rest, but still, I’ve never burned a loaf of bread in my life. So I suspect that A. my oven temp may be a bit high or B. the Chefmate Dutch Oven that was raved about so much and that I just had to have might not be as fabulous as we once suspected. Either way until Le Creuset gives in to my incessant whining and provides me with an updated line of pink products I will have to make due and simply adjust the cooking time a bit. This bread is seriously om nom nom. CK’s boss, Dave, recommended that I give the Cooks Illustrated Almost No-Knead Bread recipe a try as opposed to the more commonly utilized New York Times No-Knead Bread. I’ve been using my bread machine fairly religiously lately but the airy texture and gorgeous artisan taste and feel of this bread certainly has me thinking twice when I get the urge for some fresh homemade goodness. I don’t even mind that it takes around 20 hours for the bread to appear since the recipe only involves about 5 minutes of total effort on my part. Plus you get to use beer. Cooks Illustrated recommends Budweiser of all things but I wouldn’t be caught dead drinking or buying that so I poured in a little Sam Adams Summer Ale and thoroughly enjoyed the remainder of the bottle. My cousin Amanda and her husband also gave two thumbs up to this recipe. When the four of us got together to watch the Cavs trounce Detroit last weekend we devoured a large majority of the loaf dipping it in an addictive cheesy spinach dip that Amanda made. Don’t tell anyone but I think her new dip might rival my infamous Artichoke dip. Apparently there’s a new appetizer queen in the family. About 30 minutes before baking, adjust oven rack to lowest position, place 6- to 8-quart heavy-bottomed Dutch oven (with lid) on rack, and heat oven to 500 degrees. Lightly flour top of dough and, using razor blade or sharp knife, make one 6-inch-long, 1/2-inch-deep slit along top of dough. Carefully remove pot from oven and remove lid. Pick up dough by lifting parchment overhang and lower into pot (let any excess parchment hang over pot edge). Cover pot and place in oven. Reduce oven temperature to 425 degrees and bake covered for 30 minutes. Remove lid and continue to bake until loaf is deep brown and instant-read thermometer inserted into center registers 210 degrees, 20 to 30 minutes longer. (Erin’s Note: For this part of the recipe I only needed to cook my bread for 15 minutes due to the issues I explained in the above post. Adjust the time accordingly in line with your oven’s “personality” and the quality of your dutch oven). Carefully remove bread from pot; transfer to wire rack and cool to room temperature, about 2 hours. I’ve tried the NY Times bread, but this looks great too. It looks softer than my life. I might have to try this. I like beer, though… so this may be worth the try. worst case scenerio is I get some consolation liquid to consume so I don’t even NOTICE if I botch it up. nothing like fresh bread, a good olive oil dip, cold wine to start the summer evening. Okay, so I have that Dutch oven, I’ve made that bread, I would never buy Budweiser either (gag! ), and my husband is a huge Cavs fan. Awesome bread, isn’t it? And so pretty. By the way, it didn’t overcook in my oven, so I’m guessing the problem is your oven, and not your pot. If after leaving this bread to rise for 12 hours, you punch down the dough and put it in the fridge for a couple of days (I did 4 days) the bread will taste even better 🙂 I did this with the New York times No kneed recipe, and I was surprised at how much bigger the holes were (like Chiabatta bread)and how much better it tasted also. The bread had more of a “rubbery” texture that the artisan breads have. Hope you give this experiment a try 🙂 If you do, you won’t be disappointed for sure. I’ve been thinking about trying a no-knead recipe for quite a while now, but I’ve just had such a hard time getting my head round making bread without kneading! And I finally invested in an oven thermometer last year, and now I don’t know how I lived without it. Completely worth doing. I love the no-knead breads… makes it so much simpler to keep fresh baked bread on hand. Lori – It only seemed appropriate. It’s one of my favorite things about summer in Boston — all of the outdoor patios and Sam Summer on tap. Marina – Thank you so much for the excellent recommendation. I will absolutely give your suggestions a try. It’s very exciting to me that I actually may be able to have fabulous bread on hand now instead of running to Whole Foods to pick up a loaf at the last minute. Kristina – Well this recipe actually requires a minimal amount of kneading but nothing even close to the extent of more traditional bread baking requirements. I need to google the oven temp issues I guess. We have gas heat and gas is always so much hotter than electric. I generally always use the lower end of the “bake for” x to x number of minutes spectrum on recipes, but on my first attempt I sort of rounded up. Obviously that was a bit of a rookie mistake but I think I’ve got it figured out now. I just like to complain about Le Creuset not making a pink dutch oven anymore. It’s one of my biggest kitchen pet peeves. Bridget – It sounds like we have a lot in common. Go Cavs! One Goal, right?! (http://www.nba.com/cavaliers/onegoal/) I definitely think my issue is with our gas heat as well. It’s very hot and in general I try to use the lower end of the cook time spectrum when baking and roasting but this time I rounded up a bit. Obviously that was a mistake but I think I’ve got it all covered now. As someone who isn’t too comfortable with bread baking, a no-knead recipe sounds like the perfect way to jump in. Thanks for the recipe! I ran into my friend yesterday at the grocery store, and she was raving about this recipe, promising to copy it for me… how WEIRD that I happened to click through to your blog from Dine & Dish just now! I’m really excited to make it. Unfortunately, I get migraines when I eat malted barley flour, and all the all-purpose flour I’ve seen has MBF in it. Do you know of any flours that work that *don’t* have MBF in them? I’d love to find a white flour like that, but I’d be happy to try it with wheat if you know that it works. Thanks!! What do you do if you don’t have a dutch oven? I just took the dough after the 18 hrs rest but is so sticky. I tried to shape it on the wooden board with flour with no luck? What did I do wrong? I had the same problem that Brian is having – the dough is a sticky blob after 18 – 20 hours. It will not hold the shape of a ball (as shown in the 2nd picture from the top on this page). I have tried this recipe three times and always get the same result. I actually baked the loaf the first time and it was not good. Yesterday I just gave up and through the sticky mess in the trash and started over. Today I added 1/4 cup or more of flour during the kneading phase and it is resting now – I will bake it and see what happens….. Does anyone have a solution? I’m sorry you’re having so many problems. I honestly haven’t experienced anything close to what either of you have described. There are other no-knead recipes on the web. Perhaps you may want to try one of those instead? So I made this bread tonight, and it’s too hot to eat right now, but so far I think it turned out great. I used 1 cup of all-purpose flour and 2 cups of white whole wheat, and it’s definitely the best rise I’ve gotten out of any no-knead bread with that much whole wheat. I also burned the bottom of my bread, just a little, which is really disappointing. I have to think cooking it on the parchment paper is at least part of the culprit, although it makes getting it in the screaming hot dutch oven very easy. I’ve begun doubling up the parchment. That helps with the bottom burning issue a bit. Please let me know how it comes out with the flour mix. I’d like to try this as whole wheat as well. Now that I’ve eaten the 2/3 wheat bread, I can safely say I would make it again. If you put a little rack (like the kind used for vegetables in a pressure cooker) the bottom of the dutch oven, it will not burn and you can keep it in the oven longer and get a nicer crustier browner bread. Such a simple and yet brilliant idea! Why didn’t I think of that?! Thank you so much for the tip. I’ll definitely be implementing your suggestion the next time I make this bread. Howdy all…thanks for the post Erin. I did the original NYT one but followed the recent retesting of the recipe that eliminates the pre-heating of the pot. The side by side tests showed almost no difference in the oven spring. The preheated had a slightly darker crust but there was no crumb difference. I am just about to start the pre-ferment step of your posting. And right on with the beer comment. No Bud for this bread. Winter Hook Winter Ale. First time visitor. I look forward to exploring your site. I’ve made this bread many, many times. Used left over red wine instead of beer (pink bread!) or just ignored the beer thing and used water. Amazing. I always double the recipe ’cause if we wait that long for bread I want more than one loaf. And it freezes well. Does this work with whole-wheat flour? hi there! thanks so much for sharing this recipe. 🙂 i’ve made the jim lahey bread about 6 times and realized i’m not a fan of the dense bread. I thought i’d give no knead bread one last try with this recipe since i do enjoy homemade bread. 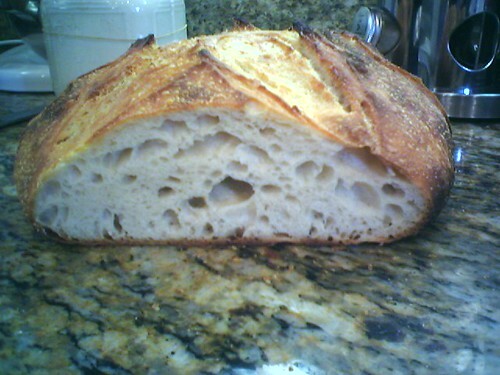 While this bread tasted great, i think i’ll stop making no knead bread for now. Hi, thanks for posting this recipe. I have made the white and whole wheat versions many times. I had the same problem with a too-dark crust until I started leaving the lid on for an extra 5 minutes — 35 minutes total. Then I reduce the final uncovered baking to 10-15 minutes. No more burned crust! Mine burned on the bottom as well? Anyone have a suggestion on how to modify this to make separate mini breads? I made this today for the first time, and it was the best no-knead. Will be making this again and again. Thank you. It amazes me thst no one spots the obvious reason why the bottom of the bread burns. Just put the rack in the middle of the oven or as close as possible instead of low in the oven. Also, if you have a convection oven use it. Adjust time to 30 minutes with cover and 10 without. Then check if the inside of your bread is at least 200 degrees F. Then turn it out on a wire rack and let it cool completely before slicing into it. I am a novice bread maker. Has anyone tried Spelz flour with this and if so are there any adjustments required to the recipe? Thanks.